Spring break isn’t just for college students. It’s also a perfect opportunity for families to take a break from their busy work and school schedules. If you’re taking a vacation with your young ones, of course you need to pick a wholesome and kid-friendly destination. I’m sure you don’t want to expose your kids to wild twenty-somethings partying all day and night. So here are 5 kid-friendly destinations to head to this Spring Break. While most college spring breakers will be headed to Myrtle Beach, you and your family can relax in peace and quiet under the sun on the Hilton Head Island in South Carolina. It offers 21 miles of pristine beaches, 24 world class golf courses, 350 tennis courts and just non-stop outdoor adventure. 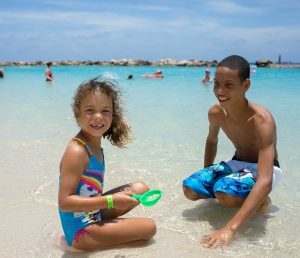 There’s just so much to do here with the whole family – from biking to hiking, fishing to kayaking, swimming to shopping and guided tours, there really is something for everyone in this island. With a number of museums, zoos, waterparks and of course, the world famous River Walk, families will surely enjoy exploring this city in south-central Texas. Have a memorable underwater experience at SeaWorld, a thrilling adventure in Six Flags Fiesta, a visit in the Natural Bridge Caverns and get to know more about Texas by visiting the Institute of Texan Cultures. Spring break isn’t just about sand, water and outdoor adventures. While everyone’s out there flocking the beaches and resorts, it’s the perfect time to head to the Big Apple. The city that never sleeps offers an abundance of iconic landmarks, entertainment and fun activities for the whole family. You don’t have to fly to Japan to witness the beauty of Cherry Blossoms. Visit Washington DC this Spring and don’t miss out on the annual Cherry Blossom Festival. Book your trip between March 15 and April 16 to see the Cherry Blossoms in their full splendor. For families who prefer the snow and want a ski excursion, Colorado offers a bunch of ski resorts with great deals for you to enjoy this Spring. In Sunlight Mountain Resort and Crested Butte, kids ages 12 can ski for free. This entry was posted in Children, Extended Family, Parenting, Travel. Bookmark the permalink.